If you are looking for a tool that makes you design easier and faster, you cannot go pass Mockplus. Mockplus comes with more than 400 icons and nearly 200 components. Just drag these components into the workspace for a combination to prototype your app ideas within few minutes. Focus on design itself and no more efforts will be spent on making a component. Scan the generated QR code to preview prototypes on the actual device instantly, no USB cable or remote publishing required. Carry and share your prototypes offline with teammates or clients in order to gather feedback. The cloud sync makes it faster and easier to preview prototype on mobile device. Just focus on design itself rather than the tool. You can get started easily without the risk of falling into the tool's slave by investing a lot of time and money on learning and training. With Mockplus, you don’t need to worry about programming knowledge any more, let alone coding. Mockplus was added by Mockplus in Sep 2015 and the latest update was made in Nov 2018. The list of alternatives was updated May 2018 There is a history of all activites on Mockplus in our Activity Log. It's possible to update the information on Mockplus or report it as discontinued, duplicated or spam. A streamlined web app that helps you create and collaborate in real-time on wireframes, mockups, diagrams and prototypes. mockingbird is an online tool that makes it easy for you to create, link together, preview, and share mockups of your website or application. It is not Flash based. Mock with real html components, prototype with draggable puzzle pieces & share in any browser. Collaborate through threaded comments per component + full group chat. Alternatives to Mockplus for Web, Mac, Windows, Linux, iPhone and more. Filter by license to discover only free or Open Source alternatives. This list contains a total of 17 apps similar to Mockplus. I am looking for prototype tool. I stumbled across Mockplus. After testing this tool, I am impressed with the intuitive interface. 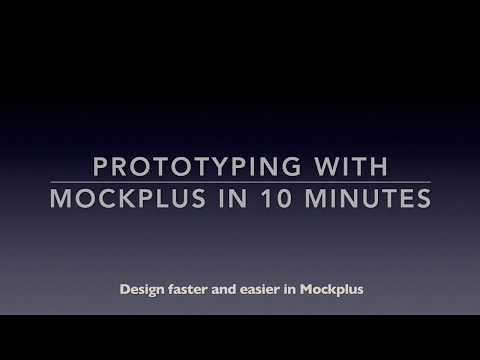 With Mockplus, I can bring out my idea to prototype rapidly without a single line of code. I highly recommend this tool if you are a UX/UI designer or a product manager. Compared with Axure, UXpin, Justinmind,Mockplus is much easier and cleaner. In fact, I am a lover of minimalism, I really like the style. Prototype design should be simple and minimal so as to express the great ideas and thoughts in the mind of a designer. Others, like colors, fonts, backgrounds, etc., are just a waste of time for prototype design I think. The free version should be renamed to unexpiring trial version, because without the ability to export, its really not free to use for real projects. Just keep that in mind if you are really looking for a 100% free program that you can use 100%.